Corned meat has nothing to do with corn. The word corn was an old English word for wheat, but was also used to describe grains of rock salt. Corned beef is basically salted beef that was cured like bacon is cured from pork. You’ve probably eaten corned beef and cabbage or corned beef hash. But have you ever considered making your own corned beef instead of buying it? Better yet, make your own corned elk or venison and if you have a smoker, you can take the next step and make pastrami. Before we start, I warn you that if not done properly, curing your own meats can be dangerous, so you must use common sense and pay attention to the type and the amount of the curing salt you use. That said, primitive people have been curing meat for a long time, long before government inspectors and even long before people knew about microbes. Many people today are curing their own meats and trust me they are not all brain surgeons. 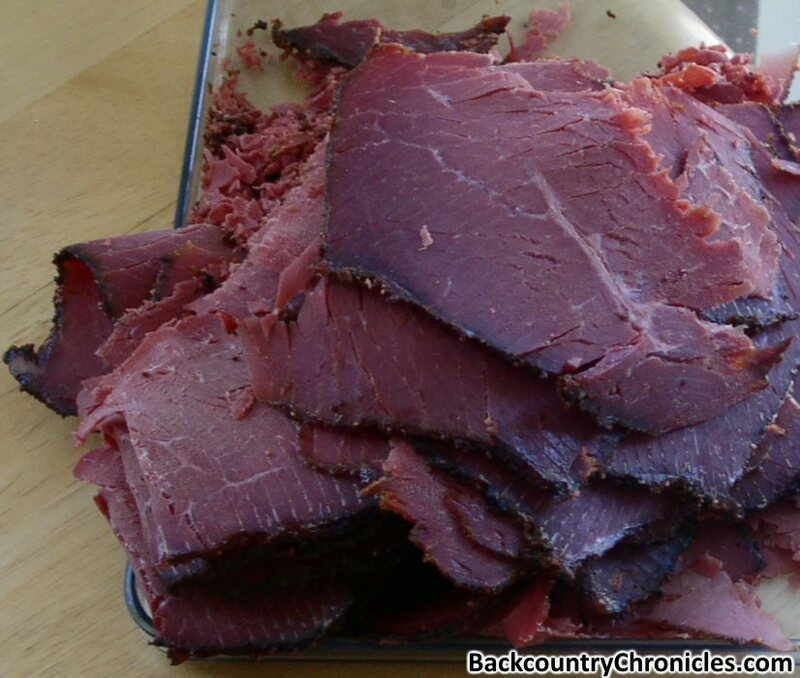 So if you have common sense, can tell the difference between Instacure #1 & #2 (Prague powder #1 & #2) and can accurately measure the ingredients, you can make your own corned beef, elk or venison or whatever wild game you have. Read More about food safety. The first step to making corned meat is to make a brine. The second step is to soak the meat in the refrigerated brine for 4 – 5 days. That’s it. Optional ingredients that can be added to the corned meat brine include juniper berries (1 – 2 teaspoons, crushed) or ¼ cup gin. Plus there a many different ingredients included in the pickling spice and different pickling spices contain different ingredients. So you can also experiment with some of these ingredients as well: cinnamon, cloves, dill seed, dill weed, fennel seeds, ginger, mace and red pepper or chilies. Add all the ingredients for the brine to only one quart of water in a pot and bring to a boil and stir to dissolve. Then pour the brine into a large food safe container. Food safe plastic or stainless steel or anodized aluminum work best. Do not use regular aluminum pots for brining. Add the remaining two quarts of cold water and refrigerate until cold. When the brine is cold, add the meat. Depending upon the size of the meat and your containers, you may have to cut the meat in half. Make sure the meat is completely covered by the brine. Turn the meat over every day and stir the brine. We corned three pieces of elk roasts (from elk hind quarter) with a combined weight of just over 4 lbs for five days. The large piece was 3 lbs, the medium piece was about a pound and the smallest piece was less than a ¼ lb. This was not our original intention, but the package was simple labeled “Elk roast 4 lbs“. Until it thawed, we did not know there were three pieces. Note to self: Label packages better. After removing the meat from the brine, the meat was rinsed in cold water and patted dry and put back into the refrigerator overnight. Some recipes call for rinsing the corned meat for up to 20 minutes and others suggest soaking the meat in water for another 24 hours to remove the extra salt. Soaking allows the salt to penetrate deep into the meat (see Photo 3 for proof the pink color penetrated the meat). Soaking will remove some of the salt, but rinsing can only remove the salt from the outside and that will be done very quickly. We boiled the smallest piece of corned elk with cabbage, potatoes and carrots just to have a taste of the corned elk. It was so good and so easy to do, we will probably never buy a corned beef again. 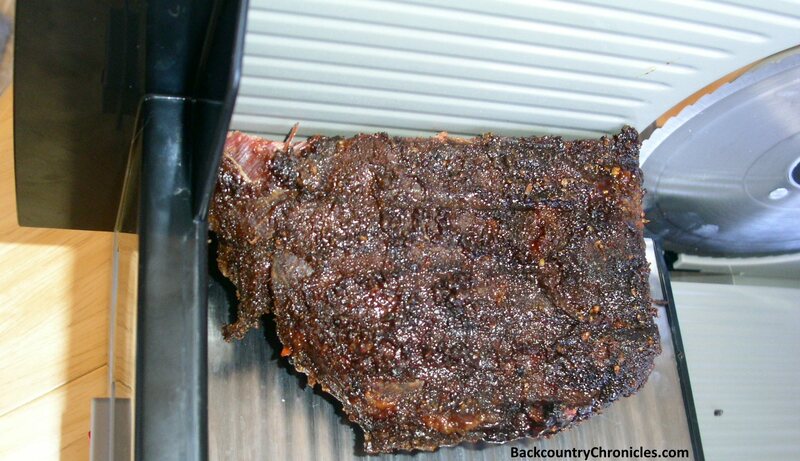 The corned elk can be smoked with or without a rub. 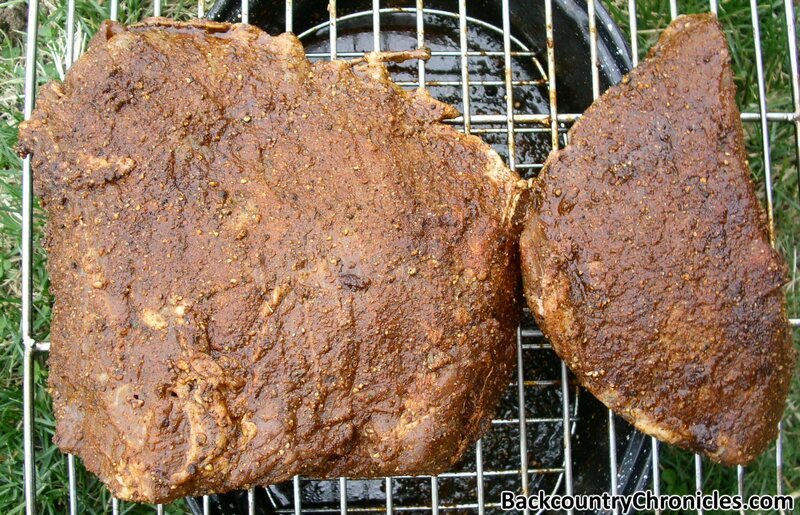 If smoked without a rub, it will be more like smoked bacon, except that elk has little fat. 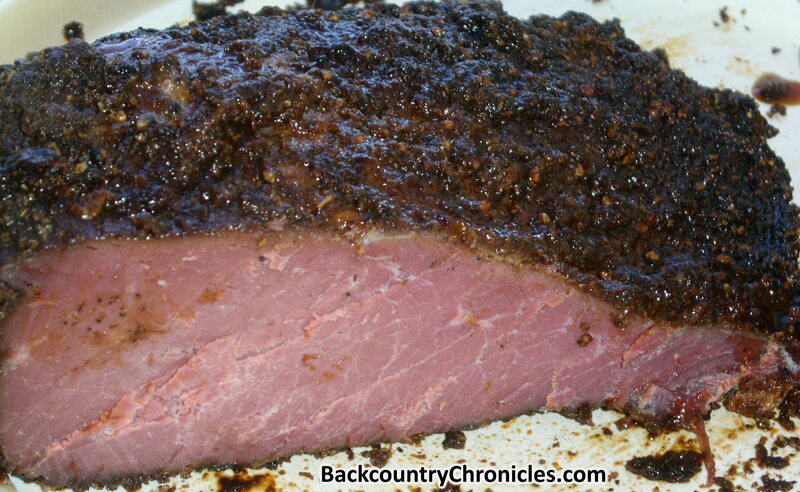 Adding a rub creates pastrami. Except for the ground pepper and kosher salt, grind all other ingredients in a spice mill or old coffee grinder. 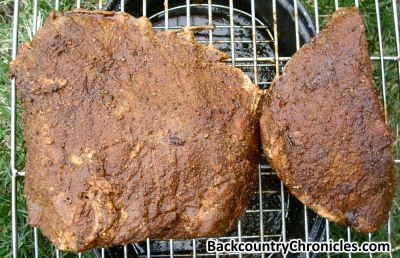 Note: The additional Kosher salt in the rub is optional since the corned elk has already been soaked in brine and cured. We decided to use more salt to rub the pastrami because we had already tasted the corned elk. Then simply rub the mixture onto the meat as shown in Photo 2. Put the rub on as thick as possible and jam it into every nook and cranny. We rubbed both of the remaining pieces of corned elk. Some recommend that rub should be wrapped in plastic, but don’t do it. The rub needs to dry a bit so the smoke can grab onto it. If you want to cover it, cover in a roasting pan. By law, restaurants have to cover or wrap any uncooked meats that are in the refrigerator to prevent cross contamination. We don’t have to do this at home, but we still need to make sure we don’t contaminate food or surfaces. We have a 10 year old Masterbuilt Smoker that is still going strong. For smoke, we used cherry wood, but any of your favorite wood should work. We set the temperature in the smoker to 220°F. The original plan was to smoke the corned elk until the internal temperature was 192°F. We have found this temperature is about right for brisket, pork hams and wild game that don’t have much fat in the meat. You will need a good meat thermometer because measuring the internal temperature of the meat is the only way to know for sure and you will want an instant read thermometer so you don’t loose too much heat from the smoker. Better yet, use a wired or wireless thermometer so you always know the internal temperature without opening the door (here’ s a relatively inexpensive wired thermometer that comes with a spare probe). Hint: Feed the probe wire through the smoke outlet and leave the thermometer on top of the smoker. Be careful not to kink the probe wire. After five hours the internal temperature of the small piece of meat was at 180°F. We tested that piece and it was tasty, very tender, but a little dry. When we smoke meat, we are always trying to find the balance between juiciness and tenderness. Pastrami should be a little drier than pulled pork or brisket, but we decided to pull the large piece when the temperature reached 175°F. So, when the elk pastrami reached the 175°F temperature, it was removed from the smoker (after about 6 hours) and was allowed to rest for about an hour at room temperature before sampling (Photo 3). That took discipline, but it was worth it. Photo 4: Elk Pastrami on the meat slicer. Since we intended to slice the rest of the pastrami very thin for sandwiches (Photos 1 & 4), the meat needed to be cold before slicing. We covered the pastrami with plastic wrap and refrigerated until the next day. We have tried to shave thin slices of roast beef or smoked turkey before with a knife, but it just doesn’t work as well as a having a good meat slicer. We chose the Chef’s Choice 615 food slicer because it has more power than less expensive models and because the parts are stainless steel and cast aluminum instead of plastic. Also, this model was easier to clean than others because all parts that get dirty are easily removed. We love it and it does a great job of making very thin slices of meat. Cold meat slices better than warm meat and you must pay attention to the direction of the grain and only slice across the grain. Some sections of meat have grain that runs in two directions. Cut these sections in half before slicing. Press the meat firmly against the blade using the meat guide to make sure your hands are in a safe position. When most of us think of pastrami we think about Reuben sandwiches, so for our first meal that is what we had. We made Reuben’s with Swiss cheese, sauerkraut and Thousand Island dressing on fresh baked rye bread. Sorry, no pics of Reuben sandwiches. We were too hungry and ate the all of evidence. Hint: If you want to warm the pastrami, steam it for a few seconds on a hot grill or pan (add a tablespoon of water and cover with a lid). This is especially good for melting the Swiss cheese. It is critical that you use the correct amount of curing salt. To cure the Corned Elk, we used Instacure #1. I calculated the amounts of Instacure #1 (Table 1) based on the gallons of brine to be made and the amount of meat to be cured based on the manufacturers recommendation of 24 lbs of Instacure #1 per 100 gallons of brine. So, one gallon of brine would require 0.24 lbs (3.8 ounces or 109 grams) of Instacure #1 curing salt. We made 3 quarts of brine mix which required 0.18 lbs (2.9 ounces or 82 grams) of Instacure #1 by weight. The amount was very close to ¼ cup, but to be safe, measure by weight. Relatively inexpensive digital scales are available so you can measure ingredients by weight. We made three quarts of brine which was sufficient for four pounds of meat and would probably have covered up to 5 lbs. Table 1 shows the quantity of cure to use for up to 3 lbs of brine, which should be enough for about 16 lbs of meat. Obviously, if you make a larger batch of brine, you will need to adjust the amounts of the other brine ingredients as well. Enjoy and tell us about your DIY wild game concoctions. Do You Make Your Own Jerky or Sausage?